2.5 hours of Equine Therapy. Equine Therapy (also referred to as Horse Therapy, Equine-Assisted Therapy, and Equine-Assisted Psychotherapy) is a form of experiential therapy that involves interactions between patients and horses. Equine Therapy involves activities (such as grooming, feeding, haltering and leading a horse) that are supervised by a mental health professional, often with the support of a horse professional. Both during the activity and after the patient has finished working with the horse, the equine therapist can observe and interact with the patient in order to identify behavior patterns and process thoughts and emotions. 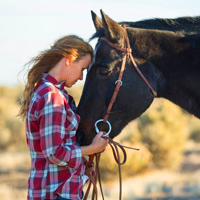 The goal of equine therapy is to help the patient develop needed skills and attributes, such as accountability, responsibility, self-confidence, problem-solving skills, and self-control. Equine therapy also provides an innovative milieu in which the therapist and the patient can identify and address a range of emotional and behavioral challenges.